If it looks like a duck and quacks like a duck, it’s a duck, right? And if it looks like a sugar cookie and tastes like a sugar cookies, it’s a sugar cookie, right? Or not. Perhaps I shouldn’t call these sugar cookies, since they don’t have a single grain of sugar in them. False advertising and all that. 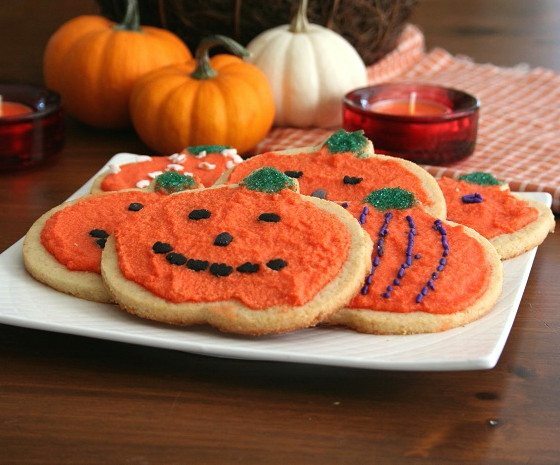 But it’s a whole lot better than calling them Halloween Cut-out Erythritol Cookies. Somehow that just doesn’t roll of the tongue as nicely. And let’s face it, erythritol is not a pretty name. 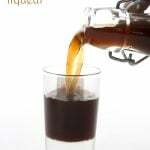 It may be the best sugar replacement on the market, one that doesn’t spike my blood sugar even a little bit, but erythritol sounds like something you clean your kitchen sink with. It sounds like some awful chemical, when really it’s something that all of us eat all the time, as it’s found in fruits and fermented foods. It will forever irk me that something I rely on so heavily now, that I think is much, MUCH healthier than sugar, has a name like “erythritol”. However, it’s October, the month of spookies and ghosts and bags upon bags of sugar. 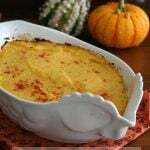 When Easy Eats Magazine requested a gluten-free Halloween recipe, I gave some thought as to what might tempt my children away from those bags of sugar. 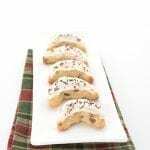 I’ve never been a huge fan of sugar cookies myself, I much prefer crispy-chewy cookies filled with chocolate and nuts. But my kids are typical kids and their eyes get big and round with excitement at the sight of frosted sugar cookies. And as I have developed a pretty great low carb cut-out cookie recipe, I decided it was time to test drive it and see how it held up to my really lousy cookie-decorating skills. I know so many bloggers who are absolute stars at cookie decorating. I see their creations and I am amazed that such works of art are edible. I have neither the patience nor the inclination to do that, I generally just slap some frosting on, spread it around, and try not to make too much of a mess. And thankfully, my kids are of the age not to really know the difference. They thought these looked amazing. A few words of note about the frosting. Mine is made with confectioner’s Swerve, and it worked out fairly well. But I have learned that if my butter isn’t properly softened before I add the Swerve, it gets a little bit of a clumpy texture that no amount of beating will smooth out. My impatience took over in this case…my butter was close to soft but not quite there, and my frosting was a tiny bit on the grainy side. Still, I have to say that for me, the end result was really pretty great. What you see here, my friends, is the height of my cookie-decorating talents. And what matters most is the taste, right? These were fantastic. Again, I am not a huge fan of sugar cookies, but these tasted EXACTLY like you’d expect. A low carb, gluten-free cut out cookie that rivals the conventional version. What more can you ask for? Carb count: I got about about 10 large cookies out of this recipe and they each had 4.9 g of carbs and 1.7 g of fiber. Total NET CARBS = 3.2 g.
For the cookies, in a medium bowl, whisk together almond flour, oat flour, xanthan gum and salt. In a large bowl, beat butter and erythritol until creamy. Beat in the egg and vanilla extract, and then beat in almond flour mixture until dough comes together. Turn out dough onto a large piece of parchment paper. Pat into a rough circle and then top with another piece of parchment. Roll out to about 1/3-inch thickness. Place on a cookie sheet and chill in refrigerator for at least an hour. Preheat oven to 325F and line another baking sheet with parchment. 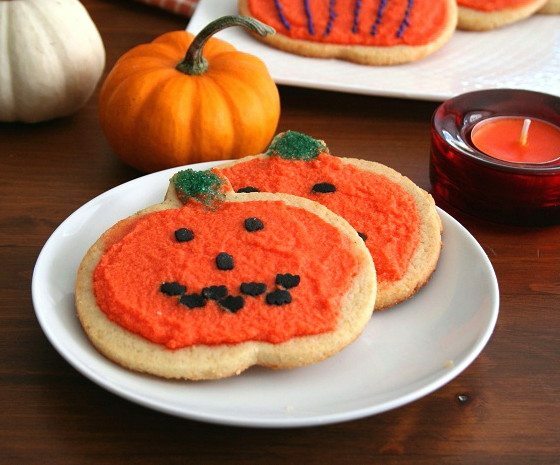 Using pumpkin-shaped cookie cutter, cut out cookies and lift carefully with a small, offset spatula or knife. Place cookies at least 1 inch apart on prepared baking sheet. Re-roll your dough and cut out more cookies (if your dough gets too soft to work with, you can put it in the freezer for a bit to harden up). Bake cookies 12 to 14 minutes, or until they are just starting to brown around the edges. Remove from oven and let cool on pan. For the icing, beat together butter and powdered erythritol. Add cream, 1 tablespoon at a time, until desired consistency is achieved. Stir in vanilla and food coloring. Spread on cooled cookies. Awww these cookies are adorable, I am off to check out the recipe now! These are so cool! And your cookie decorating is way better than anything I could imagine doing. Carolyn – I didn’t see a nutritional analysis at the recipe, but then again I don’t remember if you list that with your recipes? Sorry! I don’t do a carb count for them on Easy Eats, but I will amend that for my article here. I got about 10 quite large cookies out of it, and they are about 4 g of carbs each. Can they be frozen before putting the icing on? I want to bring them to a party but need something I can make in advance. 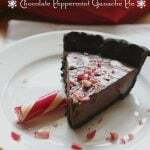 Hey Carolyn – these look fantastic… cannot wait to try and maybe use recipe at Chrsitmas time too! Do you have a carb count? I just added that to my post, right at the bottom. Sorry I forgot that part! these are ADORABLE. Just so stinkin cute! All I have to say is YAY for Sugar Cookies! Love these Carolyn! Happy wednesday! I passed the Pillsbury version of these in the supermarket the other day, and I thought, “Guess I’ll never be having that again.” I should have known better! These look tasty and cute. Way to go! I can’t wait to try these and adapt them a million ways. Which food coloring paste do you use? These cookies do look amazing!!! I used Wilton for these ones. These look so fun Carolyn – can’t believe they’re low carb. You did a great job decorating them! Have tried to research the difference between gel and paste on internet but not gotten very far. Since I did this one for Easy Eats, I need to wait a little while before I post the full recipe on my site. Is that okay with you? These are so cute! I bet you’d never know there’s not a drop of sugar in them. And, yes, they could have come up with a better name for the sugar replacement. What’s up with that? Haha — I was just thinking this as I was perusing low carb recipes for the holidays! I sometimes tell people my ery-sweetened goodies are made with Truvia (not a huge fib because that’s an ery/stevia product) so I don’t sound like I’m feeding them an exotic assassin’s poison from a Bond film! Thank you so much for this recipe. No matter how great I feel after kicking sugar and refined carbohydrates for the better part of a year, brightly colored cookies call my name. These are amazing!!! I love the fact that they are adorably cute! Does the frosting have a noticeable cooling effect in the mouth? I’ve made erythriol icing before and found the cooling to be really overwhelming. Hi Kari…not if you make it with Swerve. Swerve has a lot less cooling sensation than any other erythritol based sweetener that I know of. 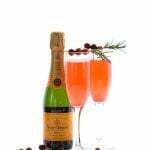 But if you are particularly sensitive to that, then it might also be good to add a really tiny bit of xanthan gum (a pinch, really), to help lessen the effect. For me, I notice it with other erythritol sweeteners, but not with Swerve. Thanks Carolyn. I will try the xanthan gum. I bought two boxes of ZSweet powdered sweetener online and I’d like to try to use it if possible. ZSweet definitely has more cooling sensation. Do be careful with the xanthan in the icing…just a little or it may gum things up! Adorable! And I bet the frosting is fantastic too. I think these look adorable! And tasty! Ingenious! You are definitely not inept with decorating cookies – I take that title, thank you! I have ZERO patience in dessert decorating category. All I care is how it tastes! We made these these Christmas cookies and the kids loved them!! Used sprinkles to decorate b/4 we baked them which upped the carb count. But kids had a blast and I was so surprised that they actually crisped up a little (more like traditional cut-outs than I thought possible with almond flour). THANKS! They are long gone, and now we are going to try them again with some icing! Question can the granulated Swerve be colored with food coloring to be used as sprinkles??? I’ve done that and it works alright. Not perfectly, but it’s better than nothing! how much flour should I cutback if I am adding cocoa powder? Also do you know if coconut oil can be a substitute for butter? Sure. Do about 1/2 the amount of coconut flour, so 1 tbsp. That should work, although the texture will be slightly firmer. Did so, and made them into Hamentaschen (3 cornered pastry eaten on the Jewish holiday of purim) and filled them with chocolate pb and homemade SF raspberry jam! they were a hit! Unfortunately the website you refer to is no longer working. Any chance you can post the recipe again? I’d love to make these. Thanks! I know, I just found that out! 🙁 Here’s the recipe (I don’t have time to format it right now for the blog). For the cookies , in a medium bowl, whisk together almond flour, oat flour, xanthan gum and salt. In a large bowl, beat butter and erythritol or sugar until creamy. Beat in the egg, and vanilla extract, and then beat in almond flour mixture until dough comes together. Preheat oven to 325F and line another baking sheet with parchment. 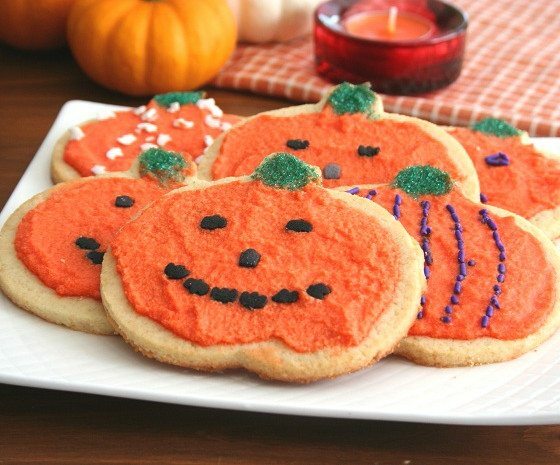 Using pumpkin-shaped cookie cutter, cut out cookies and lift carefully with a small, offset spatula or knife. Place cookies at least 1 inch apart on prepared baking sheet. Reroll your dough and cut out more cookies (if your dough gets too soft to work with, you can put it in the freezer for a bit to harden up). For the icing, beat together butter and powdered erythritol or sugar. 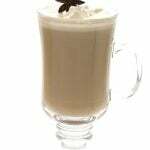 Add cream, 1 tablespoon at a time, until desired consistency is achieved. Stir in vanilla and food coloring. Spread on cooled cookies. Not exactly the same, no. But they can be used interchangeably for the most part. PS – congrats on the weight loss! Oops, poor proof reading, of course meant xanthan. I made these into Raspberry Linzer Cookies. I cut out 24 stars, half with a cut out hole in the middle. When cool, the cookies with the holes I sprinkled with powdered Swerve, covered the other cookies with sugar free raspberry jam then put them together. It made 12 sandwich cookies at 3.7nc each. For the raspberry jam, 150g frozen raspberries cooked with erythritol , 150g chopped cranberries cooked with erythritol and some raspberry extract or 6TBS of Sugar free raspberry jam are all about equal. Thanks so much for all your yummy baking! Can you use regular food coloring? Also do you thing this would work as a crust. You always seem to know the answer. You are like St Anthony to me . He helps me find also of thing lol. Sure, you can use regular food colouring but I am not sure how much. Add a little at a time until you get the right colour. As for crust, I suppose it depends on what crust you plan to use it for. It would make great crust for bars of some sort. Do you think oat fiber would be a good sub in place of the oat flour? I bought a bag to make your french toast and was looking for other recipes to use it with. These and the sugar cookie bars look so good. I just wasn’t sure if it could sub in place of the oat flour. Thank you so much! I can’t wait to make these! Sure, I think you could use it here easily. I think in these cookies, you could get away without it. they will be a touch more fragile. Cute..,but taste like shoe leather?? Are you asking if they do or saying that they do? We certainly didn’t find it to be so and you can see from the comments that no one else did either. Mine was not a question mine was why did mine taste like leather… A friend and I got together very excitedly to make a batch each of these cookies and follow the ingredients to a T and went to taste them at my next eating opportunity and was very disappointed they have no taste and the rather chewy. 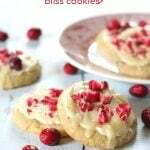 I am used to sugar cookies having kind of a crispiness and these deathly do not… I made a similar cookie with other things added to it and no xanthan gum and that seems to be the only difference… Any suggestions? They taste so blah but I don’t even want to bother frosting them. Sorry, I don’t know what to say. They have been well received by my friends and family. I’d suggest you use the recipe you like better. Carolyn we just made them the kids and I and they loved them! I have to work on my frosting had to order the powder swerve online :/ i used granualted Swerve but def a great cookie! Can i add cocoa to make chocolate sugar cookies? Yes, but cut back a bit on the almond flour too so that your dough isn’t too dry. How much would you suggest on cutting back? I am so happy I flund your site and recipes! Thank you so much!!! Are you just trying to replace the oat flour? Then use coconut flour but only use half the amount. 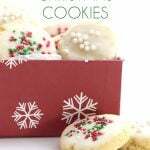 Been looking for good cookie recipes that my “sugar free” family can enjoy. So glad to have found your site!!! What a treasure trove of ideas, can hardly wait to try them all. Made these today with my kids, and …almost… decided it would be a “one and done” recipe since the dough was so fussy (as the dough warms to room temperature, even during just the time it takes to cut a few out, it gets creamy and impossible to manage, especially by the kids). Then … we tasted the first batch. Oh, my goodness, they are AWESOME! Dead-on sugar cookie flavor & texture!!! So buttery and delicious, they don’t even need the frosting. Managed the “fussiness” by using the freezer … a lot. Froze the rolled out dough as recommended; then re-froze the cut dough before removing the individual cookies (made it possible to simply peel them off the parchment without damaging them); then *re*-froze the pan of cutouts before placing it in the oven. Worked like a charm, and the results are so worth it! We will be making these again tomorrow, this time coloring part of the dough to make them a little fancier for Christmas. Kids can’t wait! 🙂 (Using a traditional 3″ cutter set and rolling the dough to about 1/4″, this easily made about 30 cookies. What a low-carb coup!!!) Thank you for this awesome site. I’ll be coming back … a lot! The dough is tricky, it’s just the nature of the beast with low carb and gluten-free. But SO glad you liked them enough to work at it! Do we have to use that thickener,, what about bakining powder? You can forego the xanthan gum but you may find that your cookies are more crumbly. This recipe does not require any leavening agent. Hi Carolyn, I would love to make these cookies for my daughter. Could you tell me what sugar/no sugar toppings you used to accent the cookies. I didn’t know if they have sugar-free ones or ones you use that you would suggest. Thanks so much! I can’t find any sugar-free versions so I just try to keep them to a minimum. Carolyn, these are sooooo good! My 20 yr old grandson even liked them! These are definitely going to be made for both Thanksgiving and Christmas.! These worked well for us and have inspired me to look for new cookie cutters. Ever since my husband changed to low carb lifestyle, cookies have been harder to do. These worked – even though I did not use the recommended almond flour – we do our own in a grinder/mill. Keeping the dough well chilled was key. Also, I almost had the graininess that you mentioned in your icing recipe (and I was careful to have butter softened) and the thing that seemed to change from grainy was my final addition of Swerve, which I had premeasured and been putting in gradually as I made it. Actually, just having some good icing ideas that don’t need confectioners sugar has been a huge step forward for our family as well.. Of course, we did use green icing with St. Patricks Day just around the corner!. Hey Carolyn!! I need a good vanilla wafer recipe for low carb banana puddin. How would these cookies work for that do you think, texture wise? Sounds like your lazy version worked out well! It would be a bit drier so be prepared to add more liquid or oil. Hi Wondering what is the best natural food colouring brand is – that you trust? The cookies taste great on their own but want to try with the icing for the kids. If it’s the erythritol that’s the issue, then I have no suggested sweeteners because I prefer erythritol based ones. I hear good things about Bocha Sweet but i have yet to try it myself. 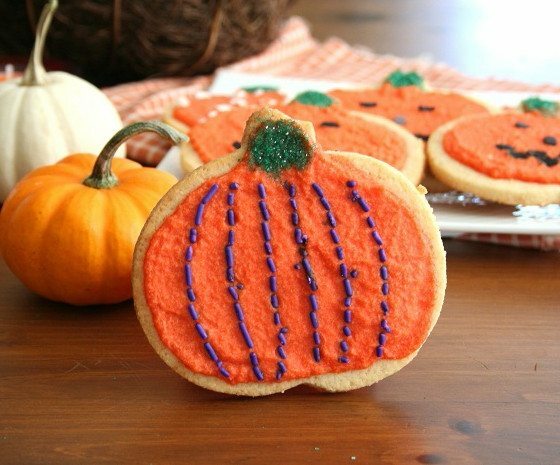 Hi Carolyn, I was wondering if you have experimented with different size cookie cutters with this sugar cookie cutout recipe. Before my diabetic days I baked cut outs and definitely noticed differences of how the cookies bake related to cut out size and thickness. I collect large copper cutters and have zero experience yet with baking these cookies so thought I’d ask. Thanks for making life sweet! I think any size cookie cutter would work but if they are very large, they may take longer to bake. Could you make these a chocolate sugar cookie by adding cocoa? If so, how much would you add and would you take out some flour in its place? Thanks!! Probably 1/3 cup would do it. And yes you will need to reduce the flour, probably by about the same amount.